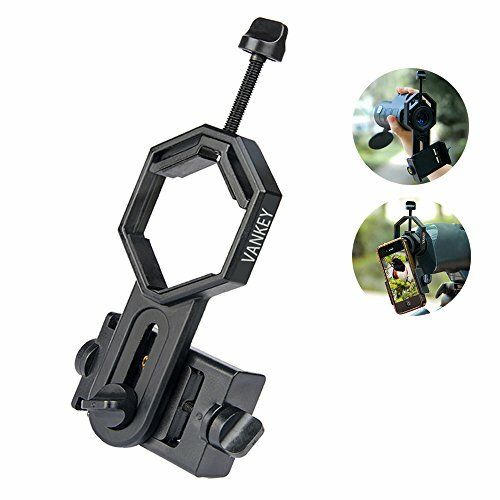 1 X Vankey Phone Telescope Adapter,Friendly Customer Service, User Guide. 1. Universal It is compatible with a variety of phones whose's width range from 2.2" to 3.9" such as iphone 4, 4s, 5, 5s, 6, 6s, 6plus, 7,7plus, Samsung Galaxy S5, S4, S3, S2, Moto Etc. 3. Phone is well protected by High density EVA pads and nothing contacts your phone's screen. 4. 23.2mm eyepiece barrel. Works on microscopes with 23.2mm optical tube..
6. Compact and light weight. 1. Set the phone in the clamp. 2. Open the camera. Look at the screen and adjust the position of the phone. There will be a bright circle when the phone and eyepiece is aligned. 3. Insert the adapter and phone into the microscope tube. 4. Adjust the focuser to get a clear image. 5. Zoom the phone to full screen. Go on Microscope Photography with your smartphone. Capture and record the beauty in the phone. Share fun with others. Works on microscopes with 23.2mm optical tube or 23.2mm eyepiece barrel. Note: Please measure the inside diameter of microscope tube if you are not sure what this dimension on your microscope is. Compatible with a variety of phones whose's width range from 2.2 to 3.9 such as iphone 4, 4s, 5, 5s, 6, 6s, 6plus,7,7p, Samsung Galaxy S5, S4, S3, S2, Moto Etc. 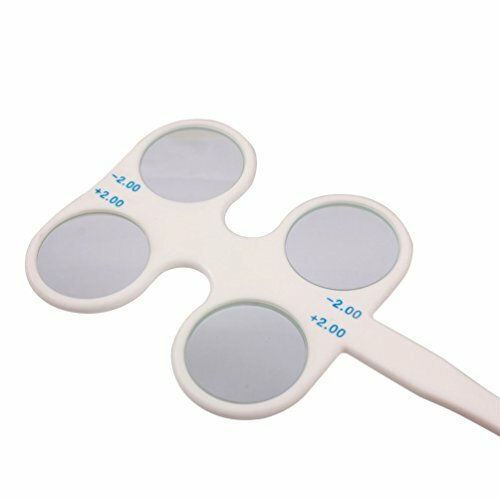 10X magnifier. Magnifier. Bausch Lomb. Hastings. 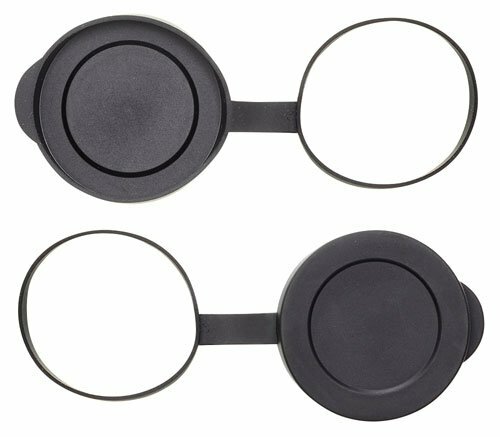 This eye-guards fit all AmScope SW, SM and ZM series stereo microscopes. They fit any eyepieces with 33 - 35mm O.D., including Nikon, Leica, Olympus and wild type stereomicrosocpe eyepieces. 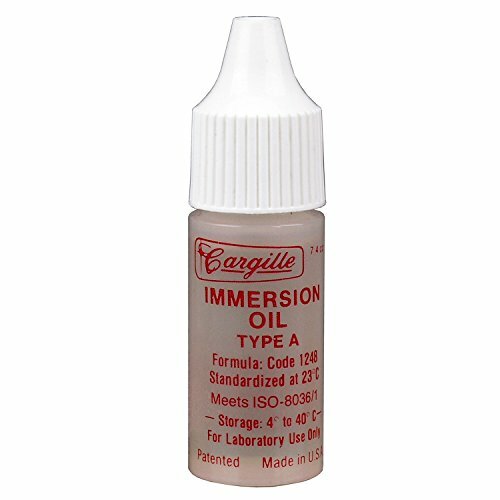 This microscope immersion oil contains 1/4 Oz (7ml) Type A immersion oil, generally used with a microscope objectives for better microscopy images. 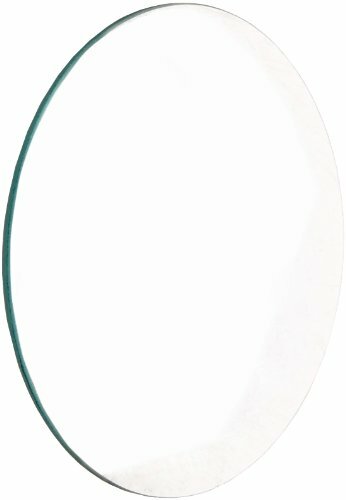 Note: how to clean Microscopes Immersion Oil?If you are using a 100X objective with immersion oil, just simply "swipe" the excess oil off the lens with a kimwipe after use. Occasionally dust may build up on the lightly oiled surface so if you wish to completely remove the oil then you must use an oil soluble solvent. For the Type A or B immersion oil, you can use Naptha, Xylene, or turpentine (use very small amounts on the kimwipe). Do not use water, alcohol or acetone as the oil is insoluble to these solvents. Consult the MSDS info that is supplied with your immersion oil to see what solvents are recommended. To remove other oily substances, we recommend using the detergent called Wisk and prepare a solution of 1 part Wisk to 100 parts water. A drop of immersion oil between the slide and condenser, and between the slide and objective lens, provides a distortion-free path for light. Safe for all lenses, this medium-viscosity immersion oil is slightly lighter than Type B. The refractive index is 1.5150, the same as that of glass. 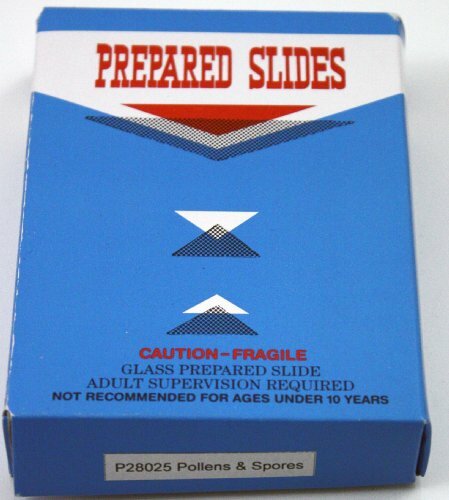 It can be easily cleaned from slides with a bit of xylene on a lens tissue and is supplied in a bottle with applicator tip so no pipet is necessary. This optical lens cleaner works for all lenses of microscopes including objectives, eyepieces and Barlow lenses. Works on microscopes with 23.2mm optical tube or 23.2mm eyepiece barrel. Please measure the inside diameter of microscope tube if you are not sure what this dimension on your microscope is. 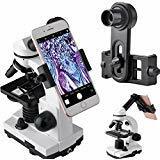 Go on Microscope Photography with your smartphone. Capture and record the beauty in the phone. Made from plate glass, with carefully ground and polished optical surfaces, and cleanly ground edges. Wallfire 3 in 1 HD camera lens can be used with a wide range of cell phones such as for iPhone 7/7 plus/6s/6/6 plus/5/5S/4/4S, Samsung Galaxy and more, work on iPad and PC too. Professional but portable to use. Clip it on the front or back camera of your phone, and it will show you another world of cell phone photography! Everyone can be a photographer of your life! Note: The macro lens can be used separately, suggest keeping 1-2cm distance from your object to take more clear pictures. Note: Please turn off the flash light by pressing 4 times (low-medium-high-turn off). 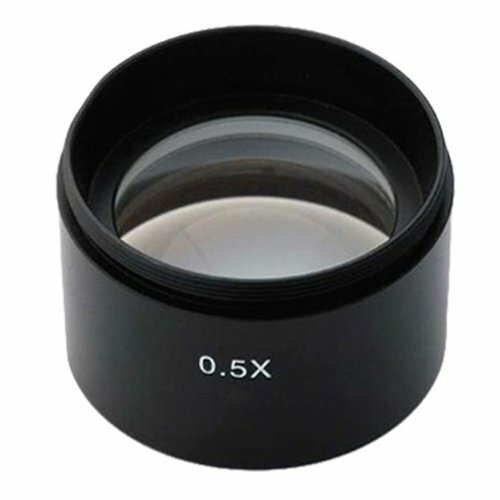 This is a brand new 0.5X Barlow (auxiliary objective) lens for stereo microscopes. It doubles the working distance and field of view of your microscope and cuts magnification power by half. This lens comes with a 1-7/8" (48mm) mounting thread and goes with SM and SW series stereo microscopes. Its retail value is $180. 0.5X Barlow lens doubles working distance and field view of SM and/or SW series stereo microscopes, cutting magnification power by half and doubling working distance and field view of the microscopes. Mounting size: 1-7/8" (48mm) in diameter. Featuring built-in C-mount compatibility and 23mm reduction lens adapter, our camera can be attached to any instrument with a C-mount or a 23mm photo port, including microscopes, telescopes, endoscopes, and etc. 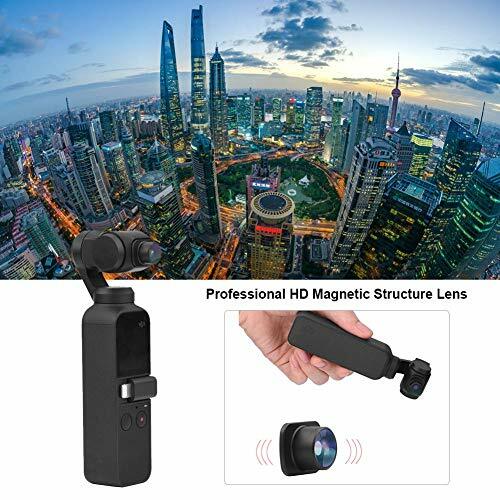 The camera's optics offers 3664x2748 pixel resolution, and the included software allows you to capture real-time, high-definition videos and stills without requiring any additional equipment. The included user-friendly software allows you to make notes, shapes, watermarks, and measurements with ease. You can analyze, present, and share images of samples and specimen by simply plugging one end into your PC's USB 2.0 port, and the other on your microscope's eye-tube or trinocular port. 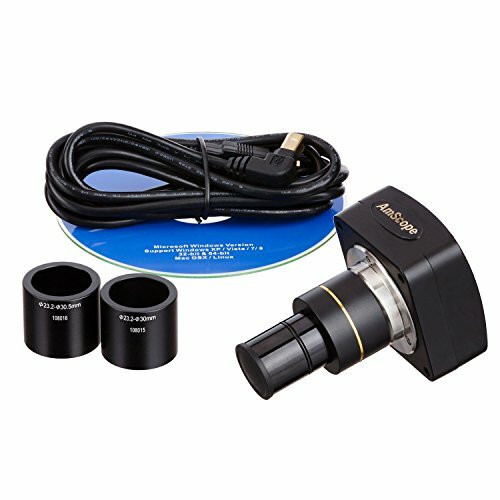 In addition, the camera comes with a preassembled 0.5X reduction lens, giving your PC screen the same field of view as your microscope's eyepiece. 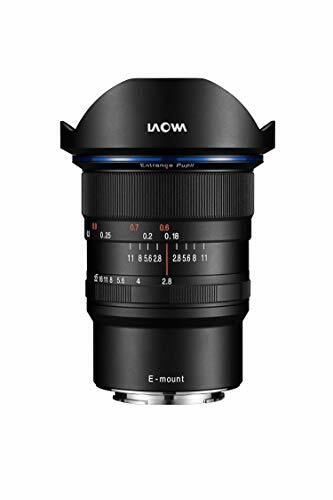 With the reduction lens in place, your camera tube is 23mm in diameter, making it compatible with pretty much any microscope's eye-tube or trinocular port. 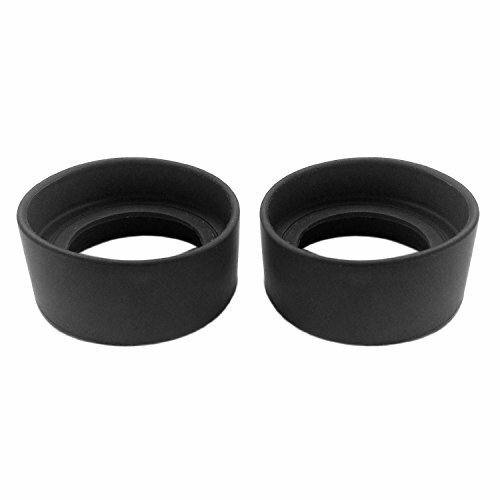 We also include 2 eyepiece adapters - 30.0mm and 30.5mm. 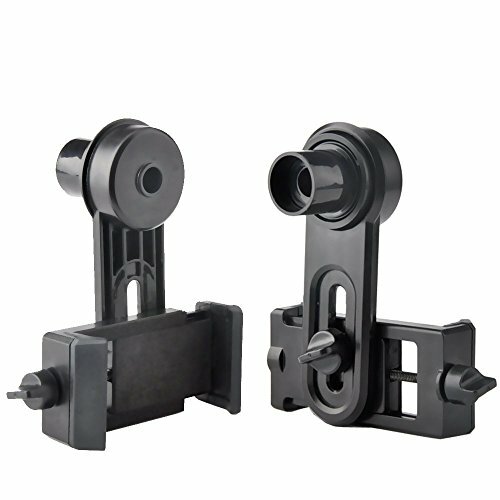 With its unique stand alone design, the camera is equipped with CMOS color sensor, and comes with a high-speed USB 2.0 cord, advanced software (Windows XP/Vista/7/8/10, Mac OS X and Linux compatible), 4 mounting sizes (23mm, 30mm, 30.5mm, and C-mount), and instructions. We are based in the USA and all our cameras come with a life-time of software upgrades. Noting: 1:For USB output, the white balance, exposure and color adjustment are automatic, they can't be adjusted. For HDMI 1080P 60FPS output, the functions can only be adjusted while connecting with monitor, if you connect the camera with computer, the functions also can not be adjusted. 2: When use USB connection, please make sure no TF card in the camera ,TF card storage is only for HDMI output. USB output will be storage in PC. 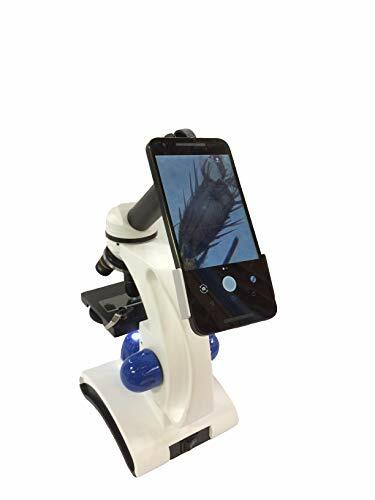 This cell phone attachment will easily capture and share photos and videos from your microscope. It's expandable nature will let you attach to any round surface from 26 mm (1 in.) to 40 mm (1.5 in.) in diameter. You can attach any phone from 52 mm (2 in) to 97 mm (3.7 in) in width. This attachment will fit any phone with any camera placement. Attaches to any round surface from 1 inch to 1.5 inch in diameter. Holds any phone from 2 inches to 3.7 inches in width. No matter the placement of your rear-facing camera, this attachment will adjust to fit. Opticron Objective Lens Covers are a neat solution for protecting binocular objective lenses from rain, dust and dirt while in transit or storage. Covers remain attached to the binocular barrel and hang down when in use. Model fits objective lens barrels with an outer diameter 58-60mm. Remember to measure the OUTSIDE DIAMETER (including armoring) of the barrels of your binoculars to get accurate sizing. Fits Opticron Models: Discovery WP PC 8x50, 10x50. Versatile Camera Upgrade Turn smartphone photography into a true art form. Take shots that stand out from the crowd and don't be limited by the fixed perspective of your smartphone camera. Experiment with different effects and fields of view. Premium Grade Our lenses are crafted with aluminum alloy and multi-element coated optical glass to minimize reflections and lens flare. Find Your Focus Take photos of breathtaking sunsets, wildlife, and sports in action with 3X optical zoom. Bring distant subjects and objects closer for perfect portraits, focused cityscape sights, and select landscape details. Universal Compatibility Easily clips on to any mobile device with included clip. Fits the front and back cameras of most smartphones and tablets, and even works with laptop webcams. No complicated setup, no special mounts needed, just clip on, focus and click for high impact 3x telephoto images and videos. Note: Not compatible with the dual-lens cameras of phones such as iPhone 7 Plus 24-Month Warranty All AUKEY products are backed by our 45-Day Money Back Guarantee and 24-Month Product Replacement Warranty. 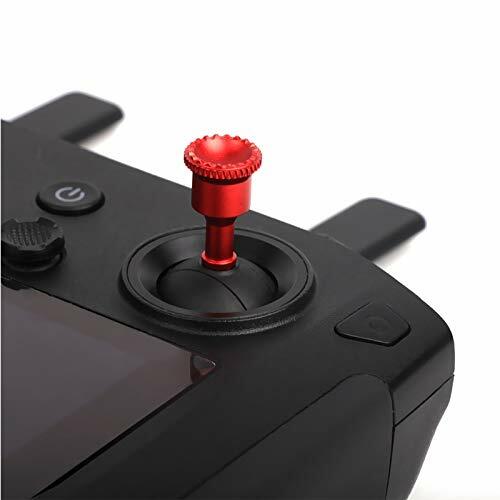 Compatible with the DJI Smart Controller. Perfect fit for the controller storage slots. 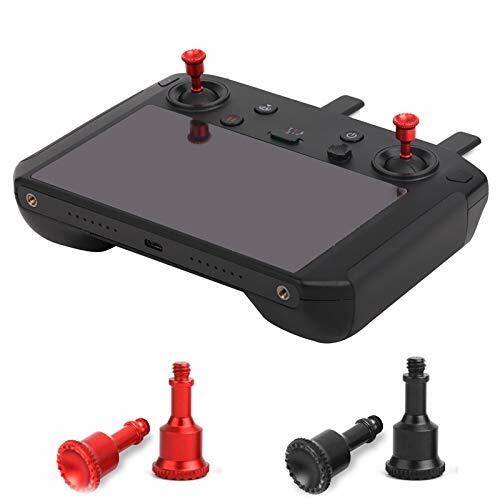 DJI Smart Controller is not included. 1. The shooting range is large, and the special arc distortion makes the shooting area have stronger visual effect. 3. Fisheye lens is a kind of special lens. Its angle of view inside is beyond the range that human eyes can see. 5. As the convex position of the external lens affects the calibration after the OSMO POCKET is turned on, the lens shall be installed for use after the OSMO POCKET is turned on and calibrated. Fisheye lens is a kind of special lens. Its angle of view inside is beyond the range that human eyes can see. The shooting range is large, and the special arc distortion makes the shooting area have stronger visual effect. 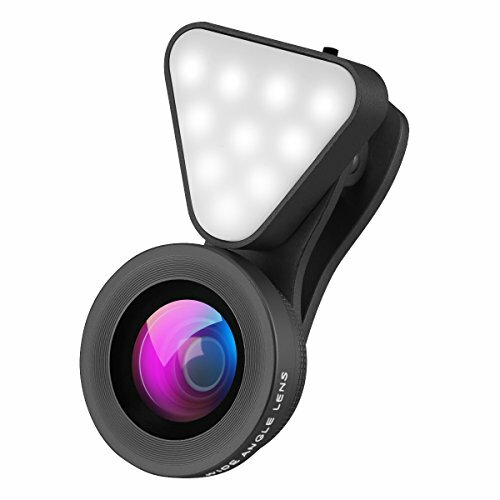 As the convex position of the external lens affects the calibration after the OSMO POCKET is turned on, the lens shall be installed for use after the OSMO POCKET is turned on and calibrated. 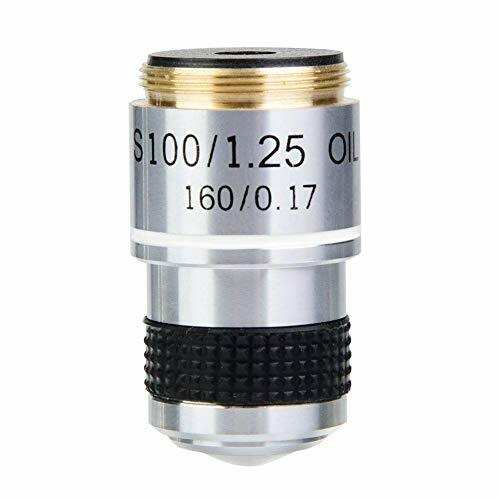 - This 100X/1.25, DIN 160/0.17(spring, oil) Achromatic microscope objective lens fits common size compound microscopes. - DIN Standard Achromatic Objective Lens. - Spring loaded for protecting lens and slides. 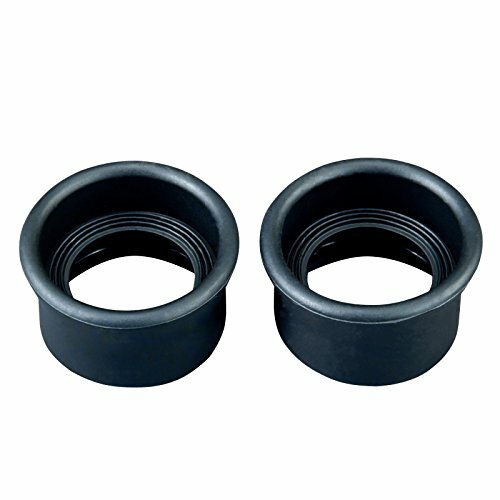 - 20.2mm RMS Mounting Thread (in diameter). 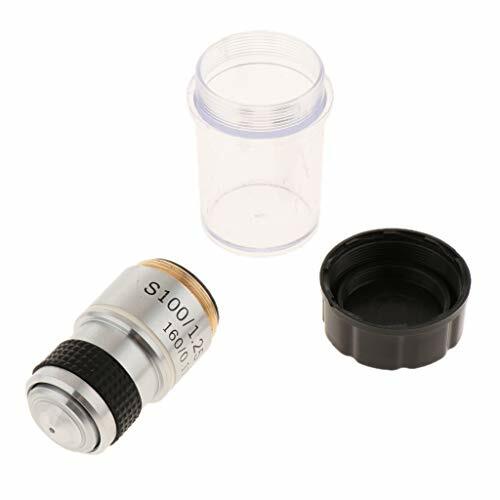 This 100X/1.25, DIN 160/0.17(spring, oil) Achromatic microscope objective lens fits common size compound microscopes. DIN Standard Achromatic Objective Lens. Spring loaded for protecting lens and slides. 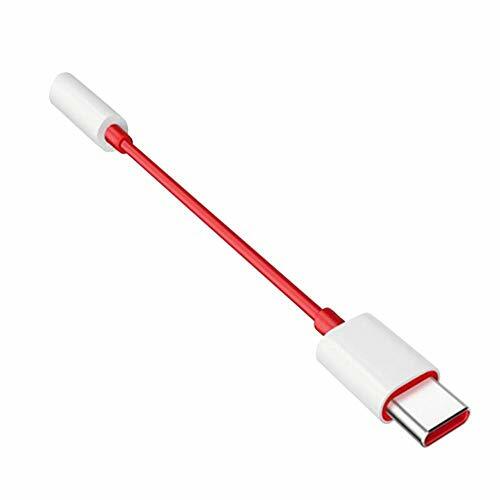 Perfect-quality material and chip ensure the stability of transmission to keep the original sound quality, enjoy your favorite music, videos, or movies freely. High Efficient Transmission and Stable Signal. Offers clear crisp sound quality and ensure the stability of transmission for better and comfortable experience. Perfect After-sales Service Guarantee and Product Damage and Unconditional Return Refund.We are dedicated to providing you with the best service and shopping experience, so that you can buy happy, rest assured, and enjoy peace of mind. With the stand, you can pick up the flippers much easier and arrange all your flippers in a line and view them in a very clear way. Your satisfaction is our priority. 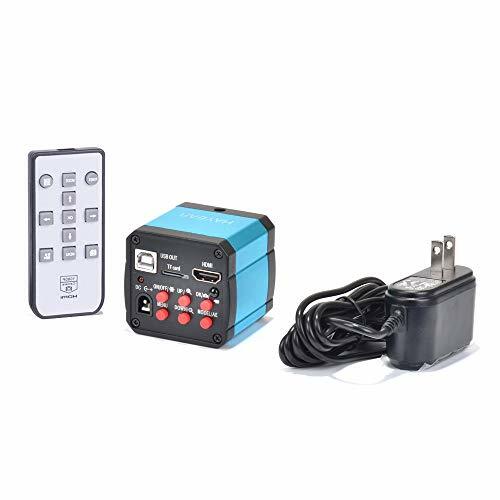 If there is any quality problem of our product or you are not happy with your purchase in our store, please kindly contact us and we are always ready to help. Material: Made of high quality of soft plastic rubber. Feature:Ox horn shape,can't be folded.Fit for 32-35mm eyepiece lens.Providing extra comfortable for eyes. 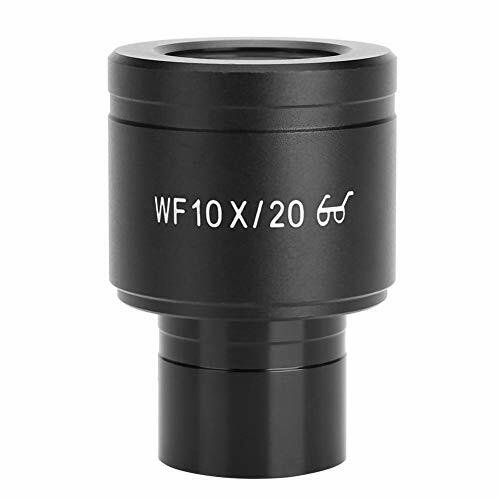 Application: It applies to Stereo Microscope Wide Angle Microscope Eyepiece, and for 32- 35mm eyepiece of the microscope and telescope and other lens, etc. 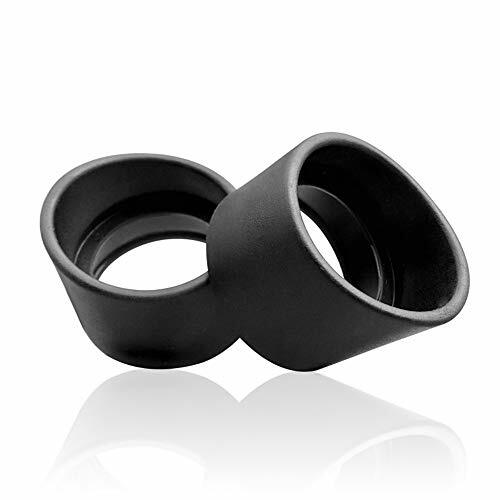 Package inludes 2pcs rubber eyepiece cover guards.The eyepieces are not included, just the eyecups! 1. Aluminum Alloy shell is precision machined, stable and durable for long time use. 2. This is a 100X achromatic objective lens for biological microscope. 3. It can eliminate unwanted reflections and increase contrast. 4. Offers high quality observation without additional chromatic aberration, make image more clear. 5. The Length of the objective lens is 38.5mm, easy to use.